I know I haven't been blogging lately, but please know I haven't forgotten about you all! This past fall, I got into a graduate program and am now pursuing a Master's degree! Life has been hectic and crazy, but now that we're on break, I hope to cook up some new tasty treats. As a special surprise, I have another Anime Re-creation! 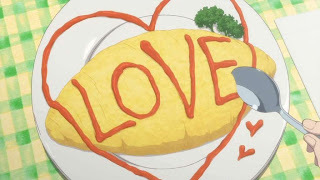 Today is omurice from Hanasaku Iroha.